The charismatic entertainer Bono paid tribute to Nelson Mandela when he and U2 met with HFPA members in New York. ""We've been working for him since the '70s when we played our first anti-apartheid gig in Dublin," he said. "He kind of turned our lives upside down." U2 were meeting with the HFPA as part of the highly successful Round Tables series of interviews which began this year. 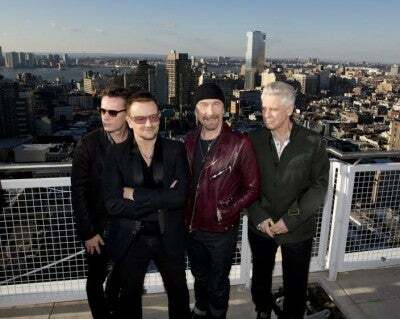 Bono, 53, talking against a panoramic view of the New York skyline in the Penthouse Suite of the Mondrian Soho Hotel, said he had last visited Mandela 18 months ago when the South African leader asked him: "Why would you want to come and see an old revolutionary like me?" Mandela's death coincides with the release of the movie Mandela: Long Walk to Freedom which stars Idris Elba with Naomie Harris as Winnie Mandela and features the song Ordinary Love which was written by U2. "It's a complicated love story so we ended up writing a complicated love song," said Bono.